“Everyone comes to see the back,” said Rich Groblewski as he gave me a tour last week of his landscape at 14 Lombardy St., Lancaster. It seems like a nice suburban yard with a new arbor (the old one was crushed under seven feet of snow in the Snowvember storm), a fire pit, small pond and flowering plants. 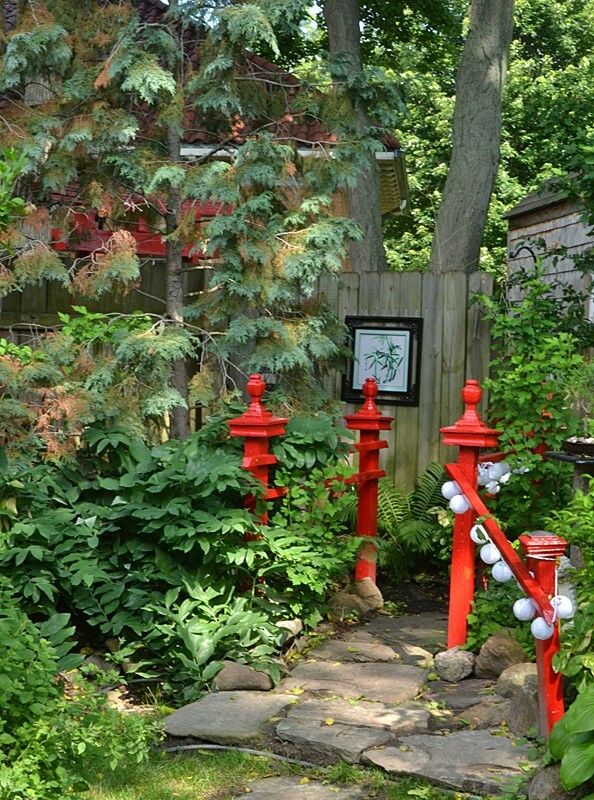 But walk a little farther back and you’ll see a path lined with bright red railings. Follow the path to a short hallway formed of high stockade fencing. The walls of the hallway are lined with displays of Japanese items. As you pause to admire the decorations, you can hear the sound of the large waterfall. Look up and you can see a glimpse of it through the window in the door. Push open the door and you have stepped into the garden of a Japanese tea house. You can see this unique landscape this weekend during the Lancaster Garden Walk, of which Groblewski is founder and chair. Groblewski’s landscape is one of 10 properties that will be open for a night showing from 8:45 p.m. – 11 p.m. Friday, July 17. To set the mood, there will be lights in the many shadow boxes hung throughout the garden, as well as candles and lasers. The Groblewskis also provide visitors with a flashlight. See a map of the other gardens on the nighttime walk here. You can also see it on the daytime walk from 10 a.m.-4:30 p.m. Saturday and Sunday, July 18 and 19. See the map of the garden walk here and a list of the gardens and addresses here. You can also pick up maps at Two Chicks and a Rooster, 732 Aurora St., Lancaster; Petals to Please, 5870 Broadway, Lancaster, and Mimi’s Central Perks Cafe, 27 Central Ave., Lancaster. Local artists will share their talents in many of the gardens on Saturday and Sunday. 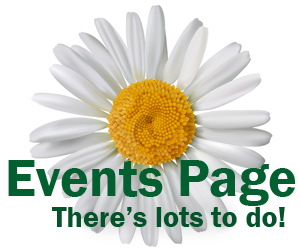 Artists will be displaying, selling and working as weather permits. You can also see Groblewski’s landscape on Open Gardens as part of the Lancaster cluster from 6 to 10:15 p.m. Thursdays through July 30. 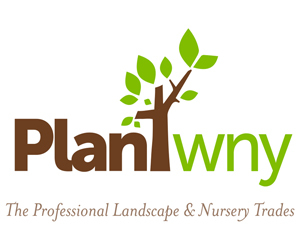 (His garden and two other gardens are open past the 9 p.m. time listed on the Garden Walk Buffalo website.) Gardens are grouped geographically. Different clusters are open on Thursdays or Fridays or both days; times vary as well. 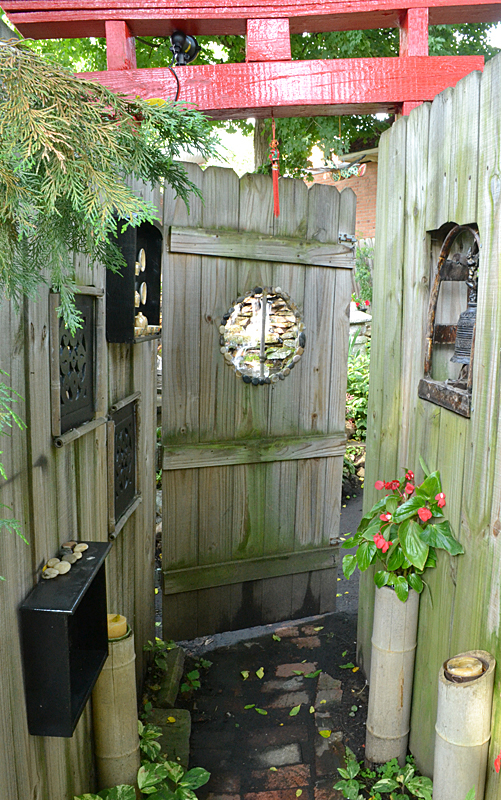 As you enter through the door to Groblewski’s tea garden, you see the seating area pictured in the first photo to your left and the huge pond and waterfall before you. To the right is yet another seating area. While it’s a dazzling view, take a moment to turn around. 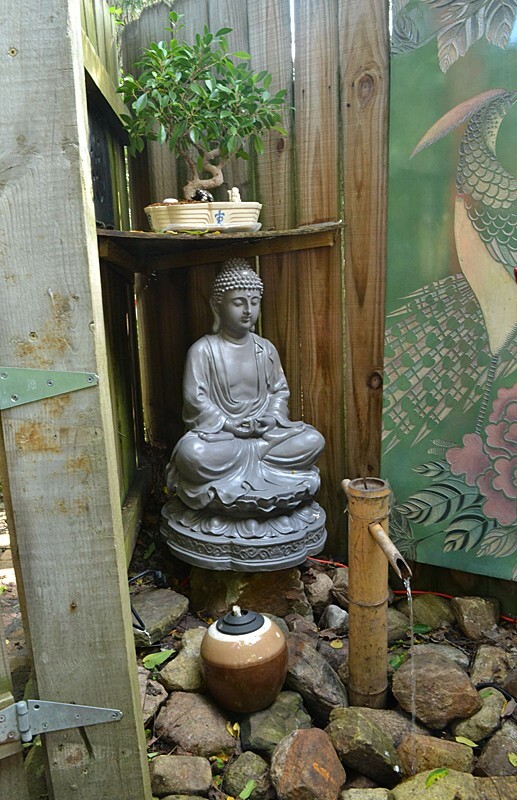 Behind you is a nook with a mural, statue, bonsai and bamboo water feature. 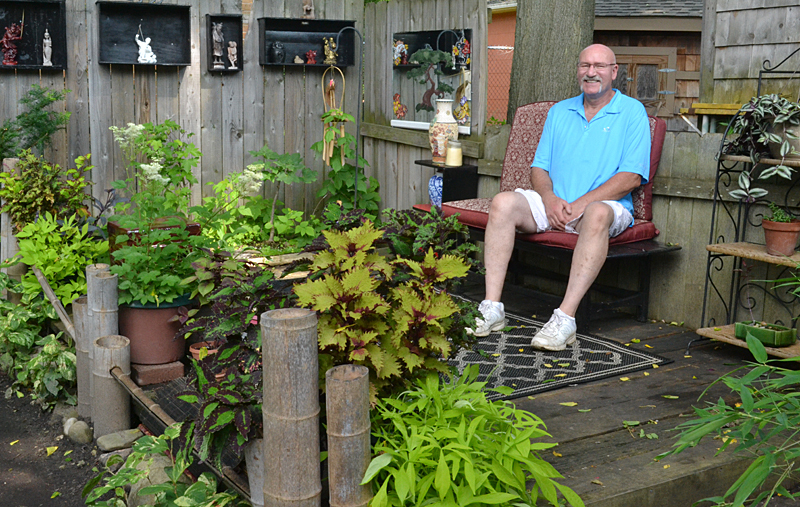 When he was in fourth grade, Groblewski had a Japanese pen pal who sent him a photo of her spectacular garden. That started his interest in Japanese culture. 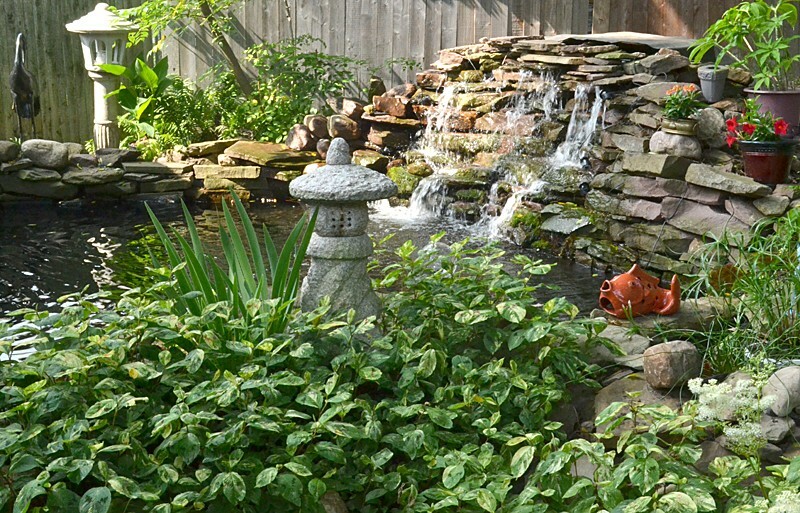 As an adult, he joined the Buffalo Bonsai Society and the Niagara Frontier Koi and Pond Club. 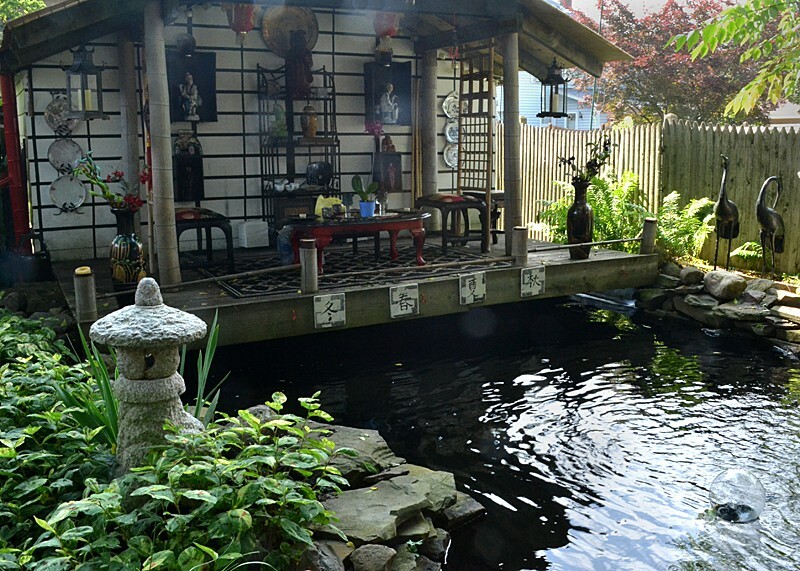 Seven years ago, he started the mammoth project of turning his backyard into a Japanese tea garden. It took him three seasons to complete. His wife Lucy noted that visitors often remark that they could never afford to build anything like the tea garden, but Groblewski did it all himself using recycled materials. Groblewski dug the pond, which is 5 1/2 feet deep in the middle, using a pickax and shovel. The Village of Depew was taking out old curbing and would have had to pay to haul it away. He was allowed to take as much as he wanted. Beaver Island State Park put in new piers, and he took the old wood to use in the seating areas. It meant extra work; there were 50 to 100 nails in each board that had to be removed first, he noted. The deck covers equipment for the pond. By lifting a couple small boards, he can access the equipment. Shadow boxes hanging on the fence were drawers from old dressers. They’re painted black, which makes them all match, and now they hold vases and figurines. All of the display items are taken back into the house in the winter. Once they saw what he was doing with his yard, people started giving Groblewski items for his garden. Someone– they don’t know who– recently left them a large paper lantern. Lucy painted cherry blossoms on it and they suspended it from a tree over the pond. The Groblewskis are looking forward to the garden walk. There are people who, like extended family, you see once a year, he said. 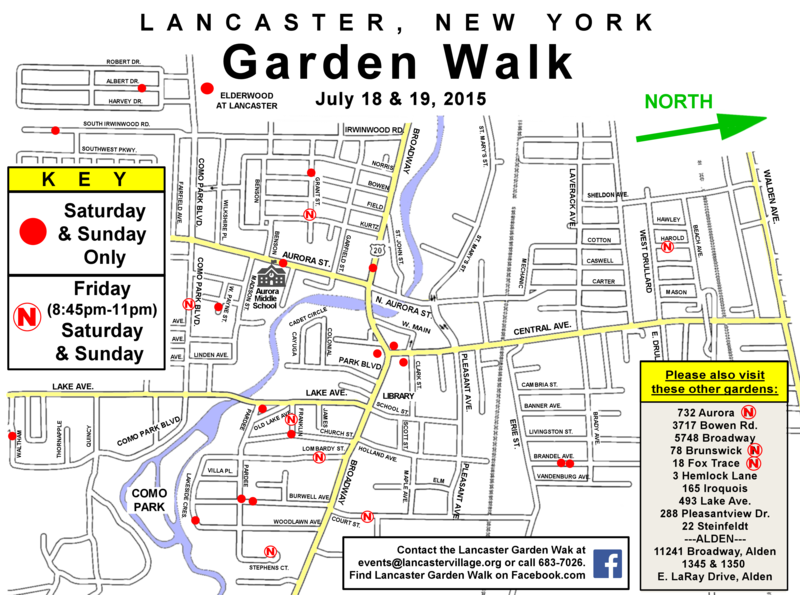 The Lancaster Garden Walk and Open Gardens are part of Garden Walk Buffalo Niagara, formerly known as the National Garden Festival. I’m speechless. What a fabulous retreat. I would say this garden transports the visitor. I love the pops of oriental red.